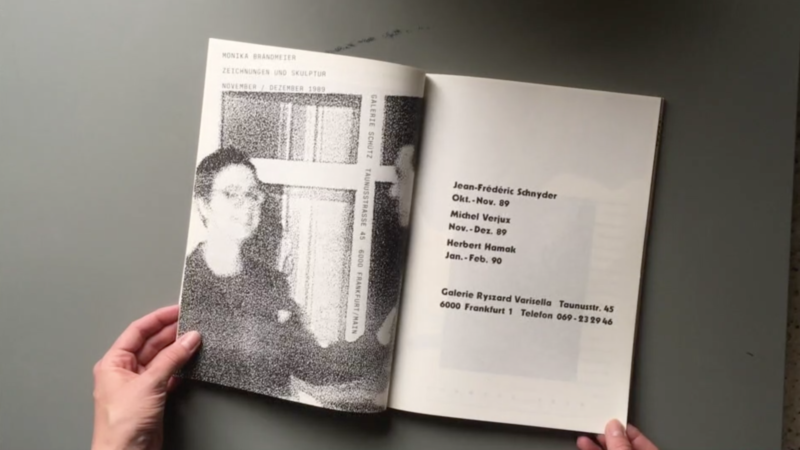 The magazine “Wolkenkratzer” emerged in 1983 from the publication Skyscraper – Frankfurter Kulturliche Anzeigen, which appeared from 1982 to 1989 in DIN A3 format and was distributed via Frankfurt galleries and museums. The Art Journal, as one of the leading German-language art magazines, dealt with avant-garde and contemporary art in an unacademic way. Sitterwerk Kunstbibliothek owns the complete collection which gave me time to scan through and create a collage showing the opposition of typographic advertisements with art photography as a new whole. Positioning myself in the Z-axis I went through magazines in the mezzanine at Sitterwerk library using axis-thinking as a tool. “Axis-Thinking” is a term founded by ambient musician Brian Eno describing the opposite of polar-thinking. The choices we could make are endless, so there is a possibility of failing explaining a strict position. Eno must have felt the same difficulty locating a place between polarised positions and thought of a term describing the oscillation between the “polars”. (Tzutzu. Axis-thinking, an excerpt from Brian Eno’s diary, 1995-2005). This capture of the Z axis is part of XYZ. Work in process: quick archive.